Sloppy Splinting Can Make A Child's Broken Arm Much Worse : Shots - Health News A pediatrician who specializes in fixing broken bones in kids and teens says about 90 percent of the fractures he treats have been splinted improperly in a community ER or urgent care center first. 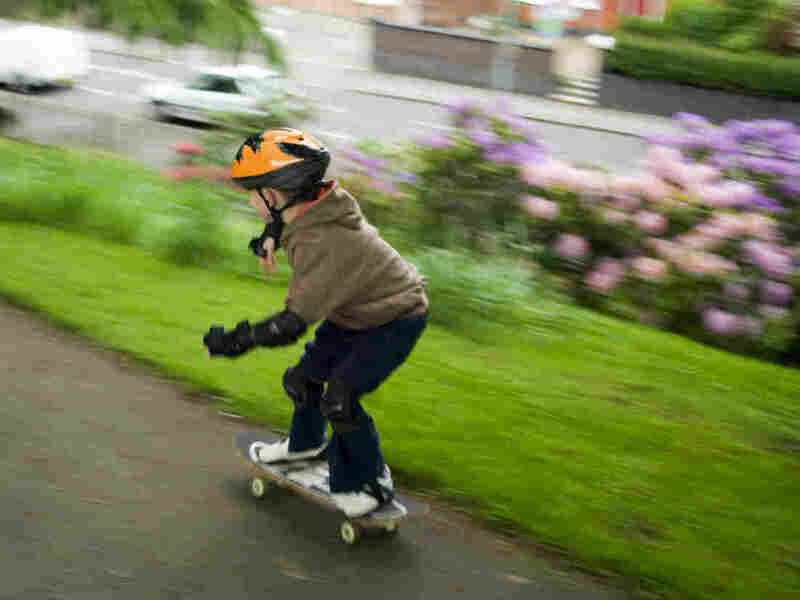 About half of all boys and a quarter of all girls will break an arm or leg before they turn 16, statistics suggest — in many skateboarding, ballplaying families, a fracture is almost expected as the price of a fun, adventurous life. And, assuming the bones are set the right way, most such breaks quickly heal without lasting damage. But research from pediatric bone specialists at the University of Maryland has turned up a surprising hitch: In more than 90 percent of the children and teens studied, the fractures weren't splinted properly by the doctors or other health workers who first treated the kids in the emergency room of a community hospital or urgent care center. If your child's complaining of a lot of pain — crying, crying, crying — don't ignore it. Either there's something wrong with the splint or with their pain management. "It's not that complicated," says Dr. Josh Abzug, who directs pediatric orthopedics at the University of Maryland School of Medicine in Baltimore. "And I don't think they're lazy. I think it's purely a lack of education in some cases, or a lack of attention to detail." He's alerting doctors to his findings this week at the San Diego meeting of the American Academy of Pediatrics. In the study of 275 young people under the age of 18 who showed up in Abzug's clinic for treatment of bone breaks, he and colleagues noted that the elastic bandage had been wound too tightly or ended in the wrong spot in about 23 percent of the cases, interfering with blood circulation. Or the stretchy bandage was placed directly on the skin instead of over a protective cotton cloth (about 77 percent of the time), often irritating the skin or even opening a wound. About half the time, the splint wasn't the right length. Or the foot, for example, was immobilized at the wrong angle to the rest of the leg. "With a broken ankle, you want to splint the foot about 90 degrees to the lower leg," Abzug explains, "so that three or four weeks down the road, when the child is ready to walk, her foot is nice and flat, instead of pointed at the wrong angle." Though he has no evidence that the problem with bad splinting is getting worse, Abzug says the typical scenario for treating these breaks has, indeed, changed in the past decade or two. In the past, he says, when parents headed to the emergency room after a child's fall, the same person who diagnosed the break would very likely fix it. Today, with increasing specialization within medicine, and a proliferation of urgent care centers, it's more common for the doctor, nurse or other health care worker who splints the break to instruct the parent to follow up with a call to an orthopedist for more treatment the next day. "For whatever reason, many parents don't follow up right away," Abzug says. "Sometimes it's a problem with health insurance, or they can't take time off work, or they just didn't understand the instructions." Wait too long with a bad splint, he says, and the medical complications can be devastating — even permanent loss of motion or a need for skin grafts. And just one night can produce lasting damage if a bandage is too tight. Posters or flashcards in ERs and urgent care centers that outline proper splinting technique could fix the problem, Abzug says. In the meantime, he urges parents to listen to their children. "If your child's complaining of a lot of pain — or crying, crying, crying — don't ignore it," he advises. Major swelling or discoloration in the area around the splint is another red flag. "Either there's something wrong with the splint," he says, "or with their pain management. Don't wait. Go back to the emergency room."